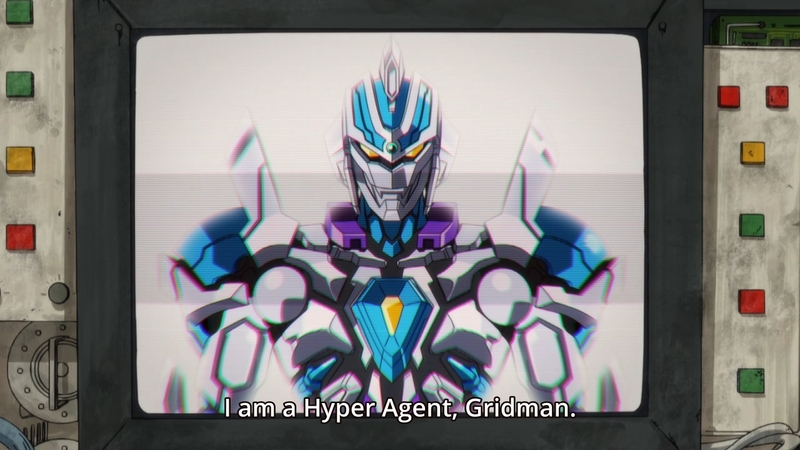 Disclaimer: I don’t know anything about Gridman, so I’m sure any references to the original 90s TV series of the same name will go right over my head. That’s fine. I’m just going to try and enjoy this for what it is. — Our hero Yuta wakes up without any memories. Had a voice not told him, he wouldn’t have even known his own name. — Since he has no memories, it’s hard to really say anything about Yuta. He doesn’t even know what his personality is supposed to be like. 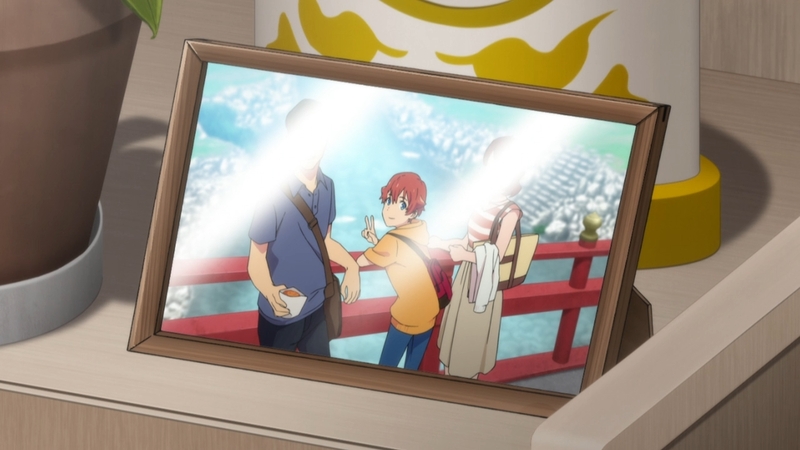 All I can remark on is his character design, and the kid looks rather dorky. — It’s bad enough being an amnesiac. 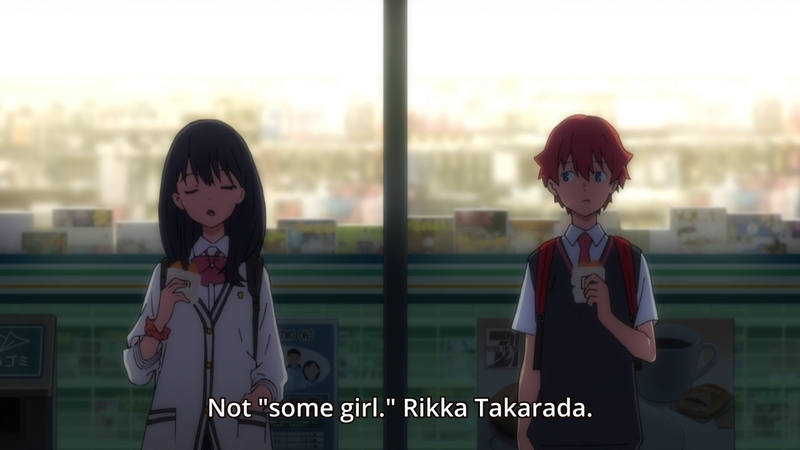 After all, his classmate Rikka seems to have a really hard time believing him. They barely know each other, but she makes it sound like something had happened between the two of them right before he got knocked out for about half an hour. 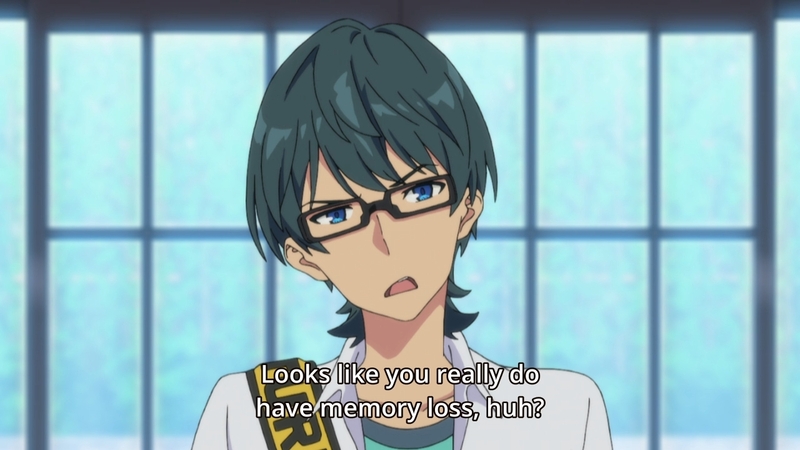 Since Yuta can’t remember anything, the girl isn’t going to explain anything either. Lame. We’ll find out eventually. We just have to wait. — The kid can also see and hear things that no one else can. 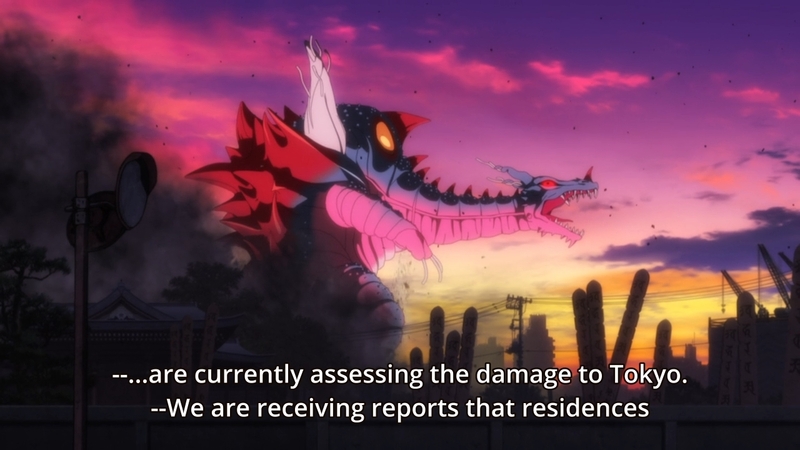 Things like, well, Gridman on one of Rikka’s really old computers (her mother runs a junk shop) and a giant kaiju looming over the city. Oh yeah, he can also see a thick mist that no one else can see. I wonder if this is a portent of some kind. — Rikka is kind of bitchy right now, but nothing too over the line. I mean, she’s not outright mean or anything. She’s just not warm and bubbly right off the bat, but things might be different once you finally befriend her. It just depends on whether or not you enjoy that challenge. 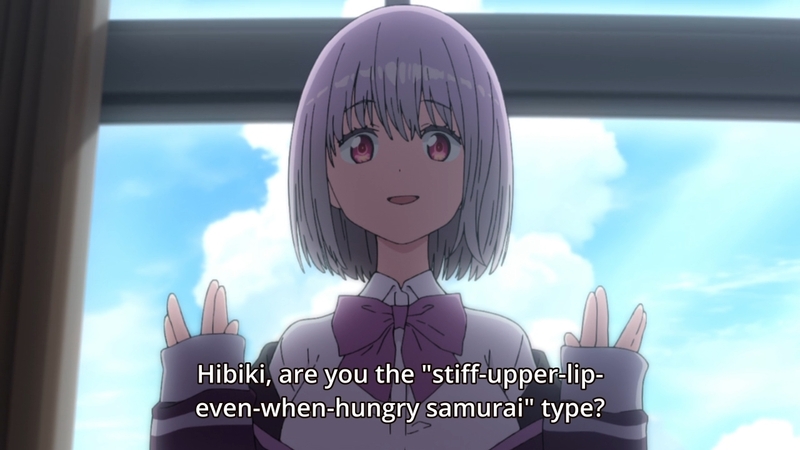 Personally, I think people with Rikka’s personality are fine. They seem like they have a bit more individuality to them, I guess. I like a girl with a little attitude. — Some guy with a really bad posture takes an interest in our hero, but he’s probably not the bad guy. He doesn’t look evil enough. — This guy is probably the villain. Well, there are two guys here, really. Someone putting together a model of a kaiju, and some robotic talking head on the screen behind said model. 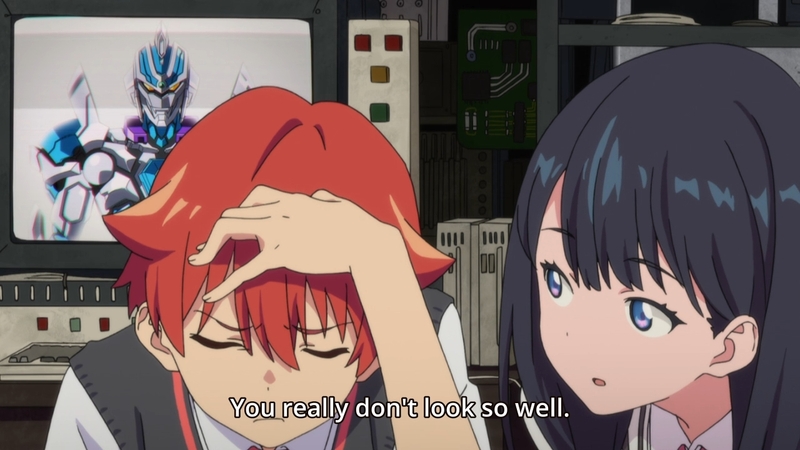 If the kaiju guy is destined to become Yuta’s foe, then the robotic talking head must be Gridman’s foil. But what are they after? Gotta wait and see. — When Yuta returns home, he quickly finds out that his parents are conveniently out of the picture. Conveniently redacted, too. They may as well not exist. Anime protagonists are forever raising themselves. — Sho is apparently the closest thing to a best friend, but they only got to know each other in April. Maybe Yuta just moved here. Or maybe he just has a hard time making friends in general. Still, Sho insists that Yuta is not a bad guy. Sure. 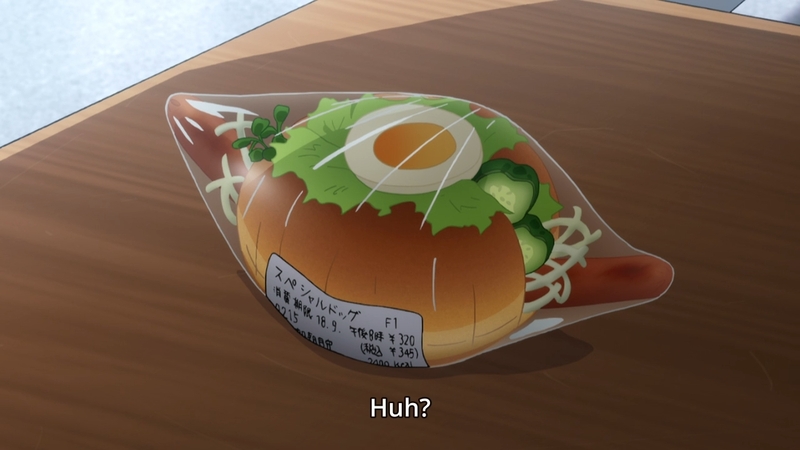 — Is this sandwich really a thing in Japan? I kinda wanna try one. — Rich, popular girl Akane helps our hero out when he forgets to pack a lunch. Can’t say much else about her, though. 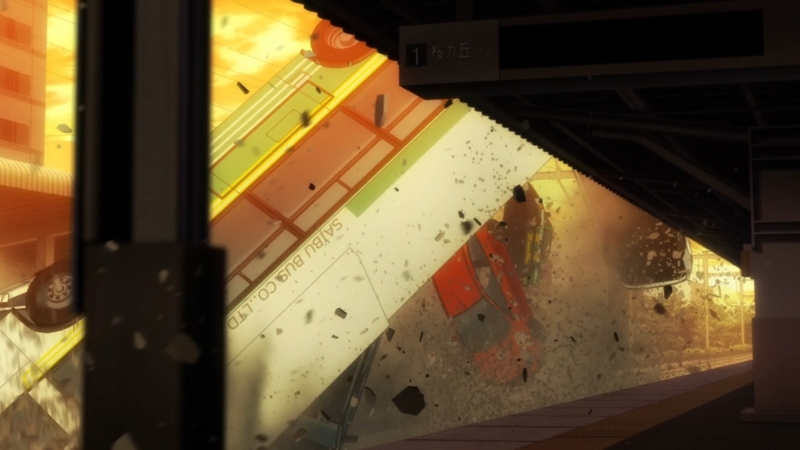 She barely gets any screentime in this opening episode. 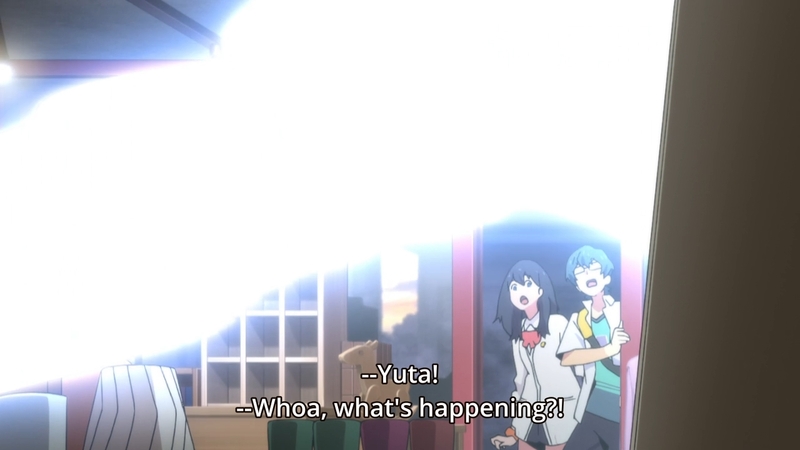 Sho simply warns Yuta to not get any bright ideas, because Akane is oh-so-beautiful and talented or whatever. Still, she was in the title screen, so she might very well have a big role to play. 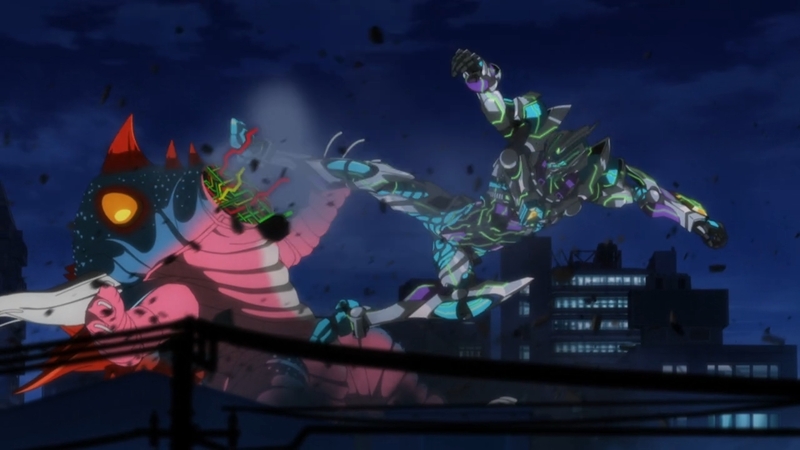 — Anyways, when Yuta tries to show Gridman to Sho, a giant kaiju suddenly terrorizes the city. We’re talking about millions — maybe even billions — of dollars worth of damage. 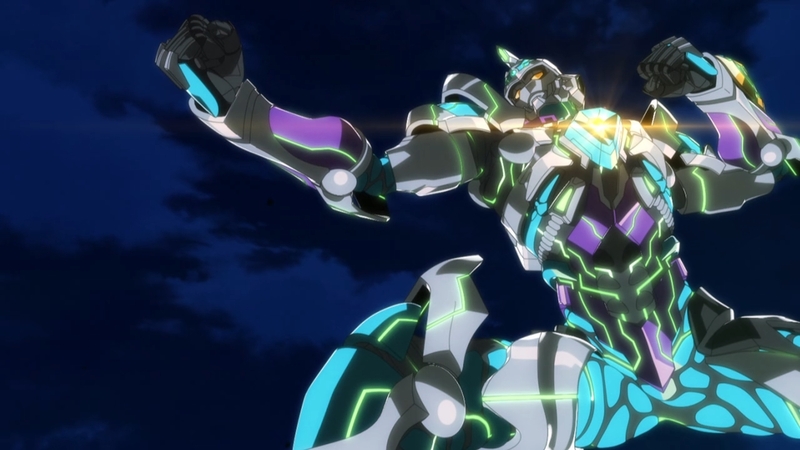 So of course, Yuta and this Gridman is going to save the day. But are you really going to tell me that nobody will die before they get the job done? All this mayhem and destruction, and yet no lives will be lost? 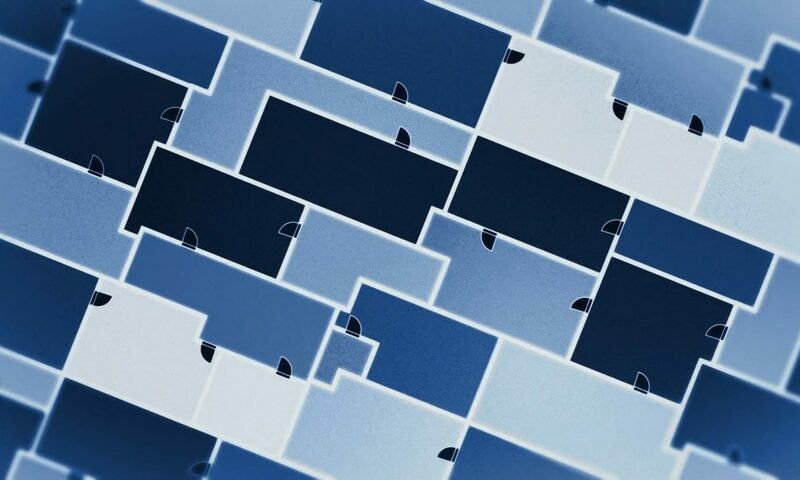 — Yuta responds to Gridman’s call to action, and before you know it, he’s being drawn into the old computer at Rikka’s place. 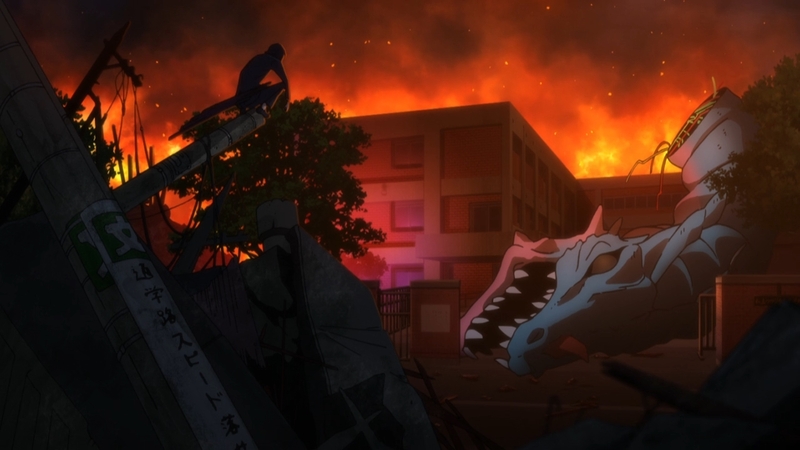 Gridman finally appears in the city to do battle against the kaiju. — The action is not bad. It’s just that both combatants look very much like toys. Well, that’s the point, I suppose. This show wants to sell us on Gridman and Gridman-related merchandise. As someone who is only going to watch the anime, however, this makes the battles look a little cheap. — Even though Yuta is the hero, he can’t do this alone. Like every anime protagonist ever, he needs his nakama. 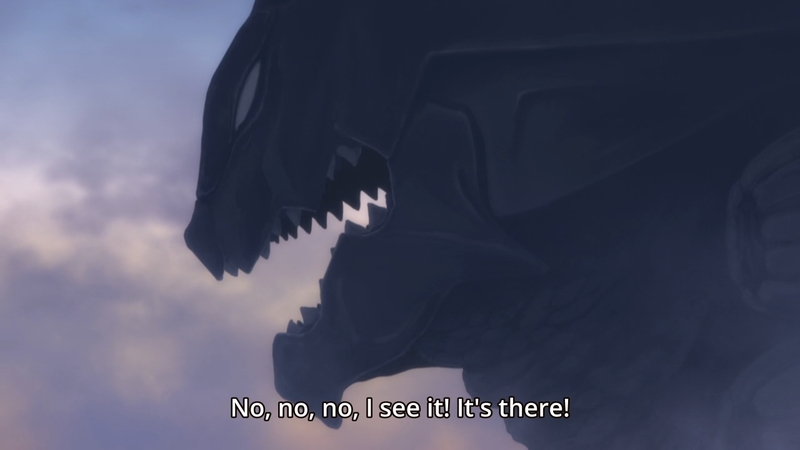 As a result, Sho will provide the brilliant battle tactics like go after the kaiju’s neck! 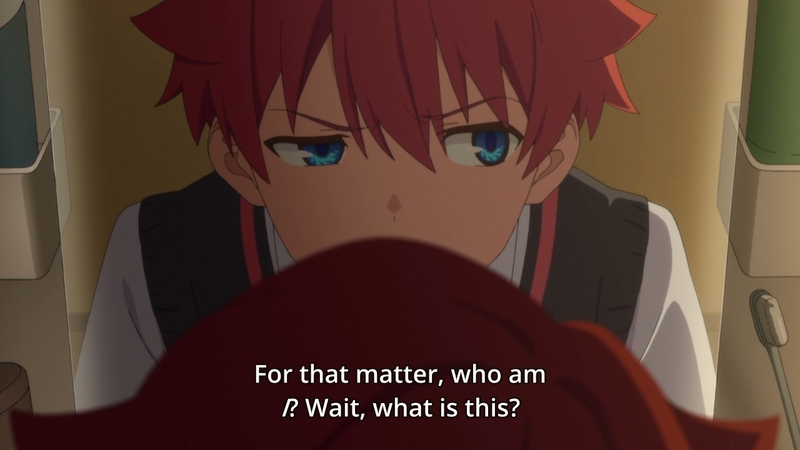 But since Sho is down here in Rikka’s junk shop and Yuta is inside a giant mecha in the middle of the city, they will have to find some way to communicate. Enter Rikka and her amazing typing skills. No, really, what she lends to the group is the ability to type. And by hammering away at the old junky computer, she is able to relay Sho’s brilliant strategy to Yuta. 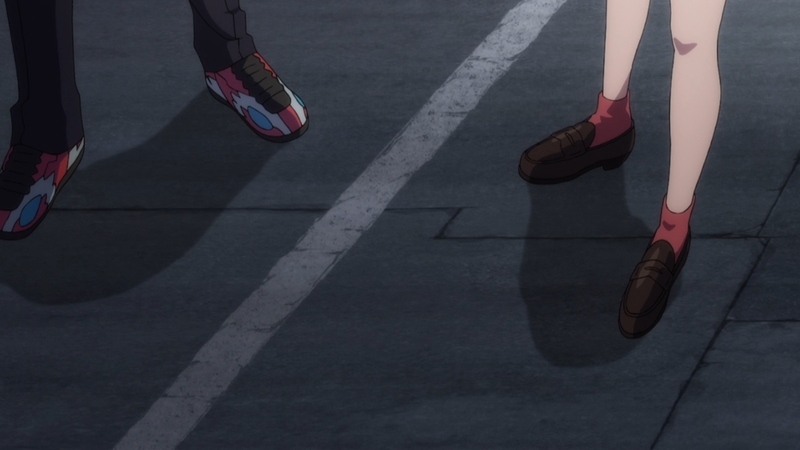 What I’m wondering is what Gridman is up to this entire time. Shouldn’t he be the one telling Yuta how to fight? — So with his friends’ help, Yuta saves the day. 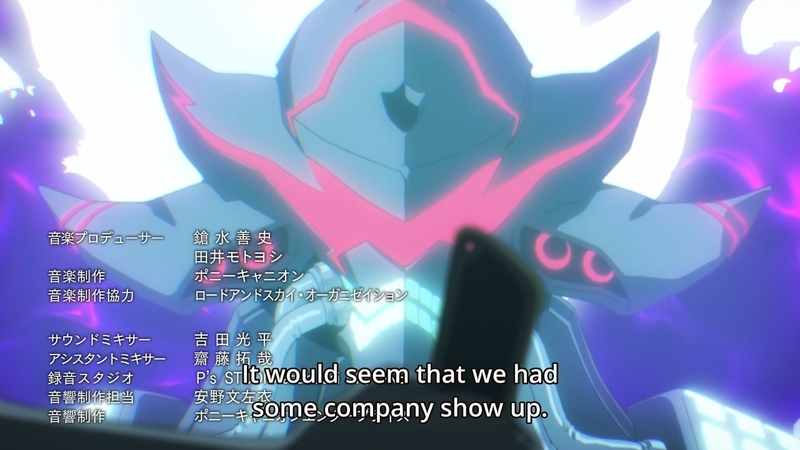 Nevertheless, Gridman tells him that this is just the beginning (duh). — Meanwhile, the bad guys aren’t happy because their best efforts have been foiled by a bunch of teenagers! Gosh, if it weren’t for you kids, I’d have a wrecked city by now! — Elsewhere, the guy with the bad posture watches as the school continues to burn. — Still, isn’t that amazing? 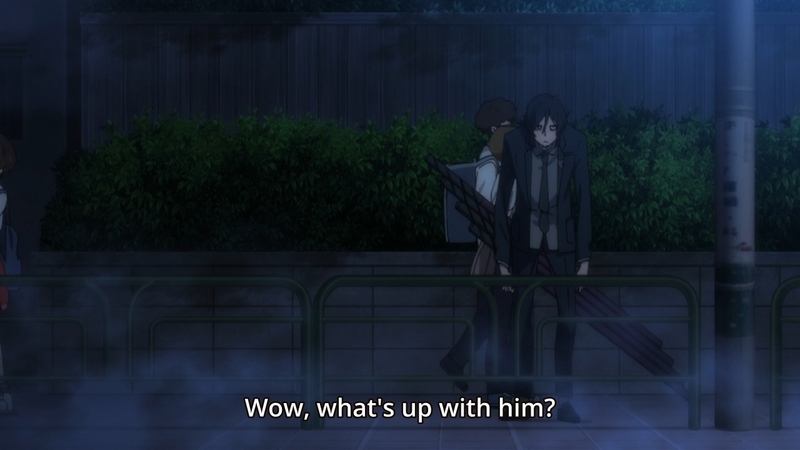 Anime characters never stop surprising me with their ability to underreact. 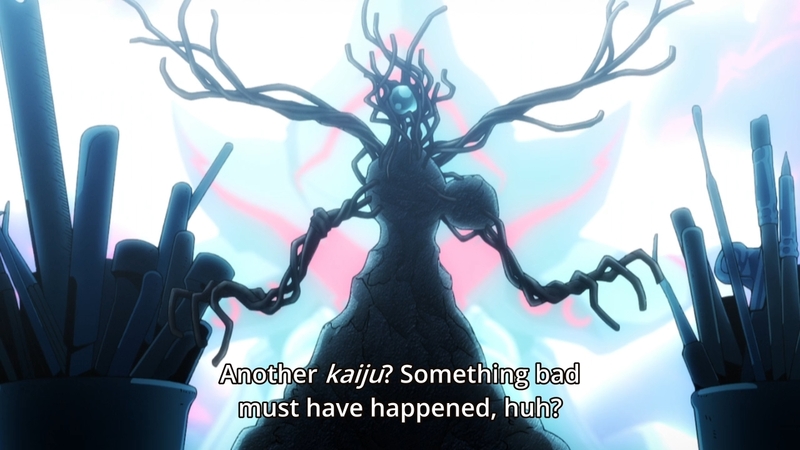 If my city just got attacked by mysterious kaiju, my first instinct wouldn’t be to go to school the next day. But whatever, it’s anime. 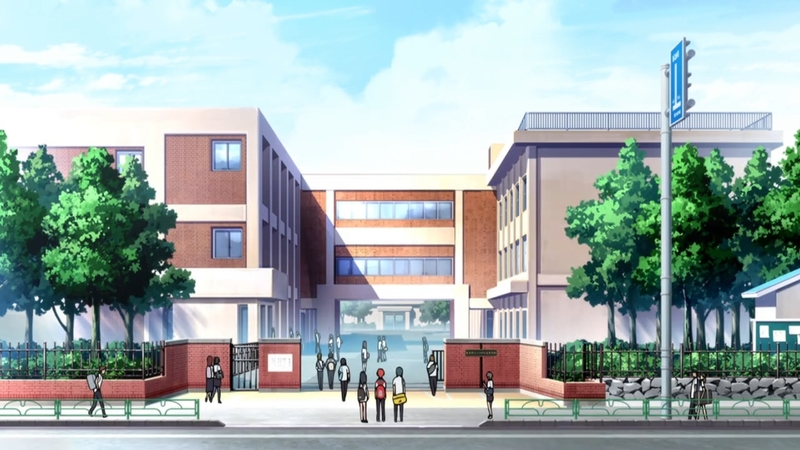 And in anime, life revolves around school. Hell, school is life. 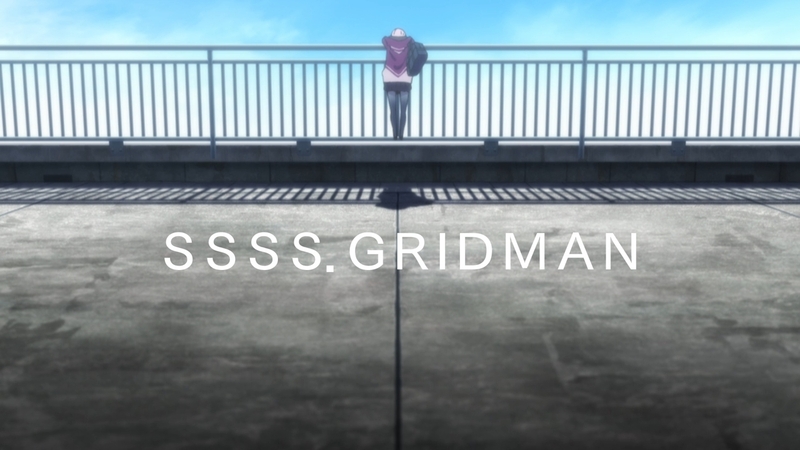 — What are my first impressions of SSSS.GRIDMAN? Pretty lukewarm. Since there’s no nostalgia factor to help smooth over the rough edges, all I have to work with is a bog standard setup. Basically, I need more characterization. So far, Yuta’s a blank slate, and I can’t say much about Sho either. He just seems like a geek, I guess? The only character I kinda like is Rikka, but barely. I want some emotions to go along with all this heroism — something to differentiate this from your average meaningless escapism. A little pathos wouldn’t hurt. 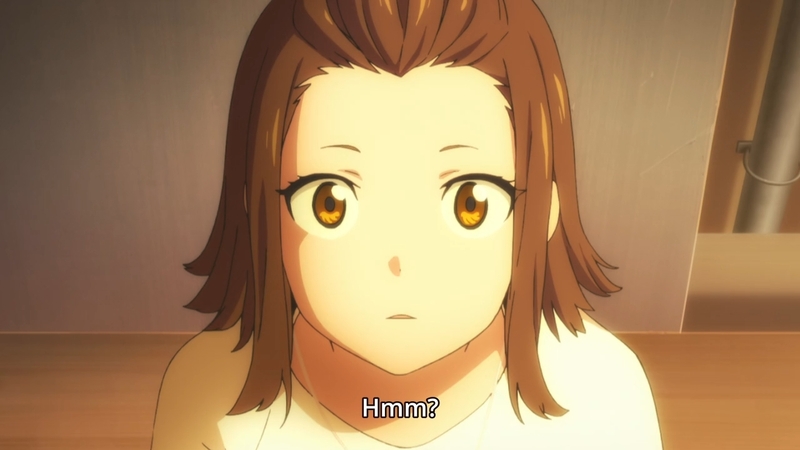 The only character that seem kinda interesting so far has her special ability to be typing. I mean what the f*ck?